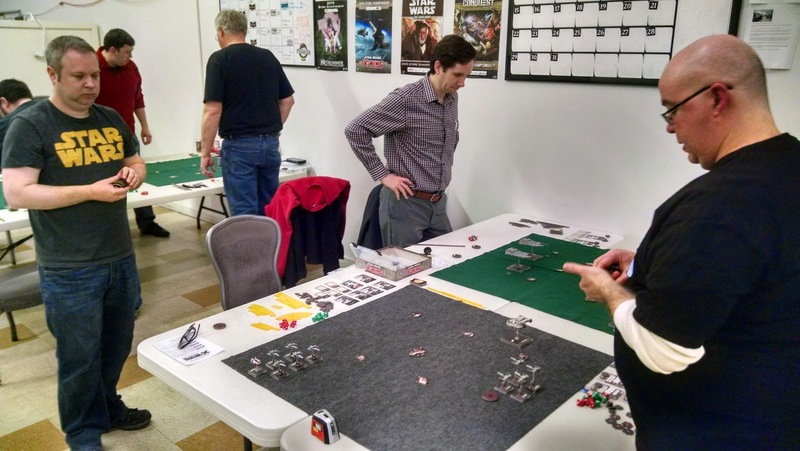 As I mentioned last week, I ran up to Armored Gopher in Champaign-Urbana Illinois for a Store Championship this past Saturday. I went up last year, had a great time, so once Sean (who lives in relatively nearby Matton) got the info for this year's tourney, we decided to hit it again. 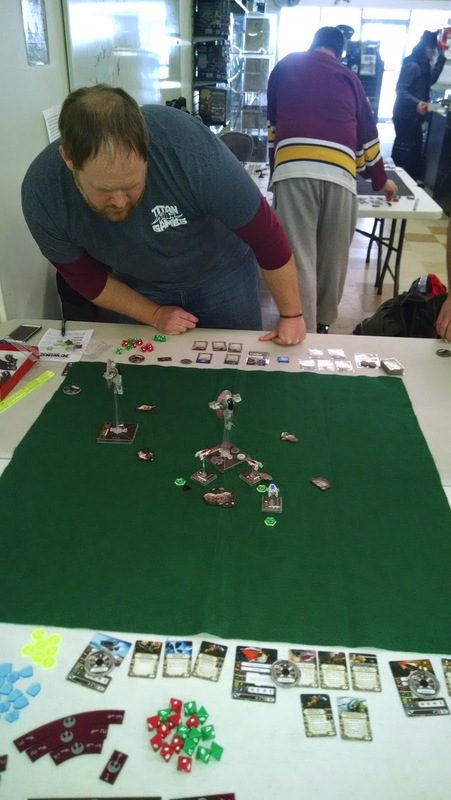 After running my 3 A-Wings list in the Store Championship here in Evansville and seeing how it played, I decided to tweak it just a little bit for reasons I mentioned before. Here's what I decided to go with for the AG Store Championship. So the only real difference is Tycho- I traded out the not at all synergous (probably not even a word, but you get what I mean) Marksmanship, yes, even before reading Punning Pundit's article on the topic, and replaced it with Expert Handling. Why you ask? 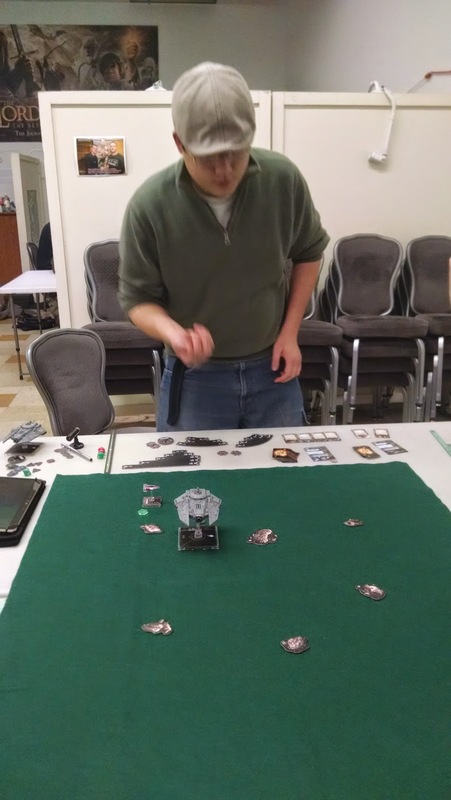 Well, with the cards I have available (though I did borrow one copy of A-Wing Test Pilot from Sean for the tournament), it was the best option for giving Tycho some extra moves. It seems like overkill, and while tomorrow I'm going to talk a little more in-depth about why I think I lost (whoops- sorry, spoiler alert! ), the long and the short of it is Tycho is the only ship in the squadron without a Stealth Device, so keeping him out of the line of fire to begin with is the best way to keep him on the table. Being able to Boost and Barrel Roll does that pretty effectively most of the time. So slightly re-tooled list in hand, Sean and I made it to Urbana with a few minutes to spare. We saw a couple of familiar faces from last year we caught up with briefly, then it was time to start. My first opponent was none other than the guy who won this thing last year, but was also top four at Gencon Nationals. You might remember him from me talking about him on here and he even wrote an article for me after the Store Championship event last year. 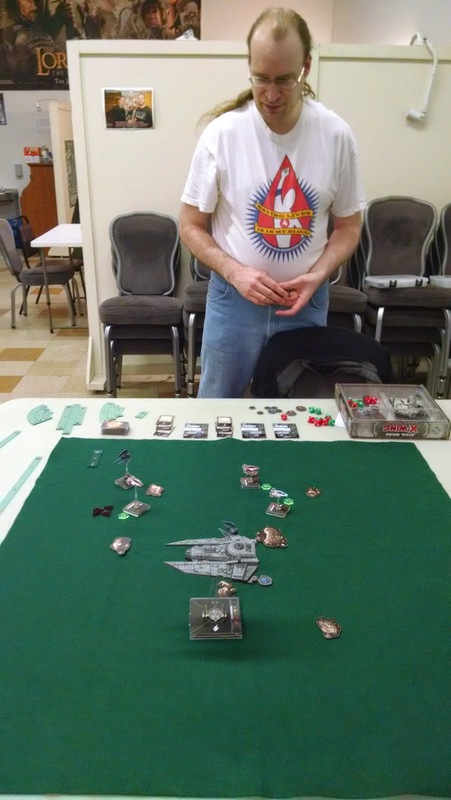 His name is +Nick Jones and he's pretty good at this X-Wing game, yo. Nick was running a Scum Boba and Scum Kath list. I don't remember all of their upgrades (hopefully he'll fill in the blanks in the comments) as I'm still not all that familiar with the Scum stuff. We faced off and while I managed to kill Kath off with a Range 3 A-Wing shot (after unloading two tubes of Proton Rockets on her), Boba had his revenge on everyone except Jake Farrell who managed to jump, jive, and wail his way right off the board edge. Ugh- how embarassing. Good match and the A-Wings didn't do too bad against these big, maneuverable, decked out Firesprays. Second match I drew another big ship list. Grant was running a pair of VT-49s. I remarked how this match was funny because it was literally the largest (non-Epic, obviously) ships against the smallest ships available in the game. Again, I apologize for not remember the exact details of my opponent's list, but as I recall Grant was running one of the VTs as a Patrol Leader and the other was being driven by Captain Oicunn. I do recall one of them had Vader, Crew Member on board- the Patrol Leader VT if I remember right. Captain Oicunn had a Rebel Prisoner on board as well as some other upgrades. 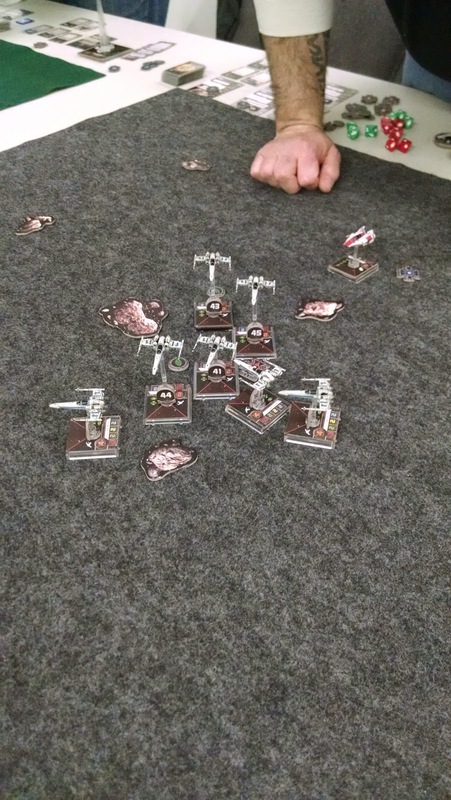 Once again, I managed to get one of the big ships off the table, but not both before my A-Wings were waxed. Note I didn't say I actually destroyed his ship- Vader self-destructed his subordinate's ship with a Hull point left to dig the shields off of somebody- Gemmer probably. Another match loss for the good guys and I'm 0-2 after two. Much like the Evansville Store Championship, my suckitude rewarded me with a bye, though Nick told me later I shouldn't have had it- apparently somebody else went 0-2 as well, but had less points than I did, but in any case, I bye'ed out of the third round, so also like last time, I walked around and took some pics of the other folks playing. 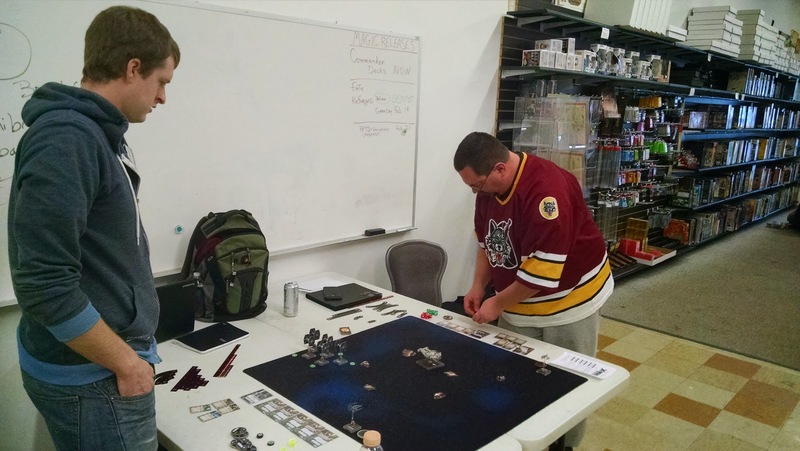 I didn't catch the guy in the Chicago Wolves jersey's name, but the tall guy on the left (he really is that tall- that's not like a perspective error) was named Tyler and he ended up winning the whole shebang with a TIE Swarm and accompanying Interceptor. I didn't play either of these cats, so I don't really know what went down in their match. Wolves was using Dash and Corran Horn if I remember right. The guy on the right is Robert and I played him in the opening round last year. He was rolling a bunch of Zs and a YT-2400, the guy on the left I believe was named Joel. I didn't play him, but he said he started out reading the Bikini. I thanked him for the compliment! He was running a similar squadron to Robert, but instead of Dash, he was running a tooled up Tycho. This match was hilarious to me because inevitably, it ended up with the Z's snarled into a hairball that resembled a pretty amazing traffic jam. The table behind Robert and Joel was Nick playing another guy I didn't play against. I think his name was Patrick (again guys- if you're reading this and I've gotten your names wrong, please correct me in the comments!). Patrick was also running a dual Decimator list, though I have no idea how he had them kitted. Moving back, Rusty in the black Harley T-shirt was running a Shuttle, Firespray, and a TIE Fighter. Again, didn't play him, no idea how they were outfitted. He was playing my second round opponent Grant who only has his hands in the frame of this picture. Sean ended up going 2-2 on the day, which put him probably around 5th place with that list. He was well impressed with Jake and Gemmer, so it's not just me! I'm sorry to say there was one other table with guys playing that I somehow completely forgot to take a picture of. There's no reason I didn't take a pic of them- it was totally unintentional! I didn't even notice I'd missed them until I was writing this article and realized I'd missed my 4th round opponent in these bye round pics. What it was, there were the tables against the wall, but there was another lone table across the aisle that guys were playing on too. I totally forgot to take a pic of the guys on that table. I ended up playing one of them in my final round, the other player was using a dual Aggressor list. I didn't catch his name unfortunately. Last round rolled around and I was actually going to be playing again. I took on a guy using a vanilla Decimator with a couple of Phantoms carrying Imperial Agents. He had driven over from Springfield (Illinois) and his name was Patrick. This match ended up being kind of hilarious to me. His Imperial Agents allowed him to look at my maneuvers, which with the Phantom's cloaking ability, allowed him to then decide whether or not he would move then Decloak or Decloak then move, or just move. That fact coupled up with Jake and Tycho's ability to move then boost or barrel roll, or in Tycho's case boost and barrel roll, made for quite the little chess match of us trying to avoid each other's firing arcs. I can't really explain to you why, but for some reason I thought it'd be fun to go after the Phantoms first. Hey, it'd been a long day and I'm not that good at this game to begin with, all right? In any case, if you have been wondering whether or not shooting Proton Rockets at a Cloaked Phantom will result in much, I can confirm it doesn't although I did manage to burn off some shields with my silliness. What's perhaps more surprising is even after screwing around with the Phantoms for about half of the game, I did manage to smoke that Decimator off the board. Gemmer managed another six dice attack using PRs along with her Opportunist skill, but I didn't roll as well this time and only managed 5 hits instead of the max 6. I believe it was Tycho who actually finished him off. Jake had been lost to a well-timed barrage from one of the Phantoms. This match ended in a draw as there were only 9 points separating us when we ran out of time- Jake as I run him is 31, the Decimator stock is an even 40. If you're assuming we didn't stick around long after because I'd placed so badly, there was a little more to it than that. 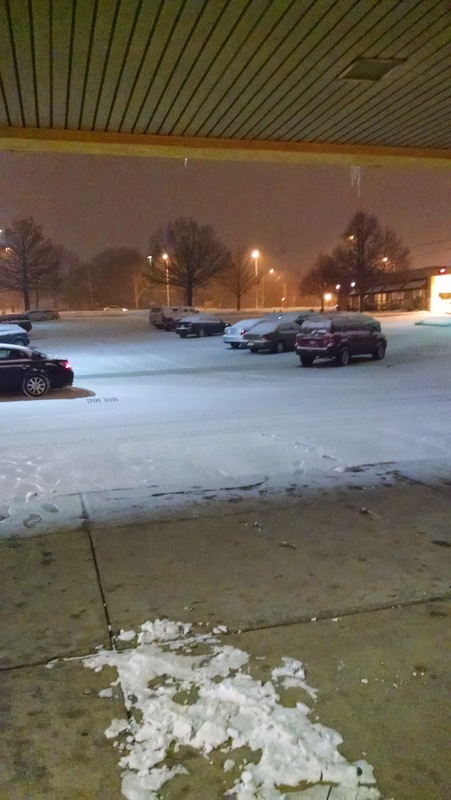 At the start of the second round, it began snowing. Nick invited Sean and I to go play some boardgames with him and his crew, but unfortunately we declined on account of the snow and the fact that we had about a forty-five minute drive back to Mattoon. Of course, that hour ended up being more like almost two hours because of the snow and also because the Fighting Illini had a basketball game let out around the same time we were trying to get out of town. Long story long, we finally made it home around 10pm including a stop by Taco Bell. We did end up playing that new Elder Sign Expansion, Gates of Arkham, with BC which ended horribly with our party being devoured by the awakened Yog Sothoth. Now, I live about two and a half hours southeast of Sean. The snow was still falling pretty steadily and I briefly considered heading home late Saturday night on account of the fact that the snow was being forecasted to fall all night and at least all morning Sunday morning. In the end though, I was just too tired and wasn't at all enthusiastic about trying to drive home in the snow that late at night, so I relented and stayed the night. Anyway, I wake up at 8am and there's like 6-8 inches on top of what the snow plow guys had removed at like 3am. Knowing the forecast had changed and now central Illinois was supposed to get snowed on pretty much all day and then some, I decided to get while the gettin' was good and took off for home. 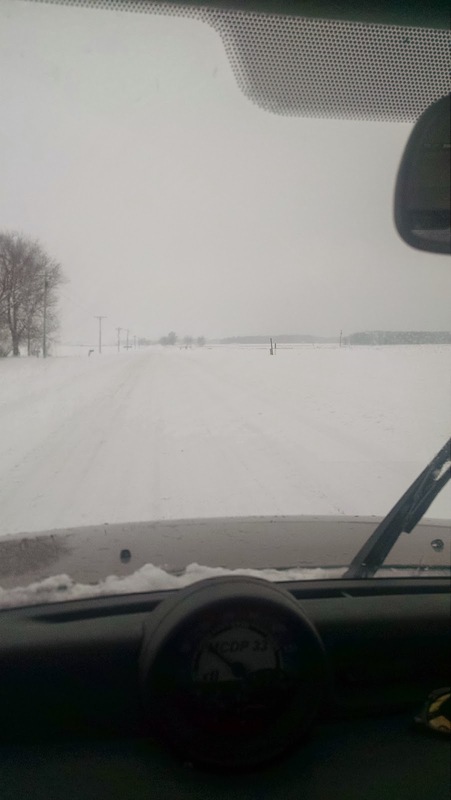 That's Illinois state road 130 just south of Charleston. Completely snow-free road a mere 24 hours prior, it was pretty much that about 40% of the way home. I didn't get the speedometer above thirty-five the first two hours I was in the car, and was below 30 for probably at least 45 minutes of those two hours. I did finally make it back to Evansville, so it's all good though my shoulders are sore from gripping... the... wheel... so... tightly. With the bye, I ended up going 1-2-1 and just like last year, had a great time despite the result. 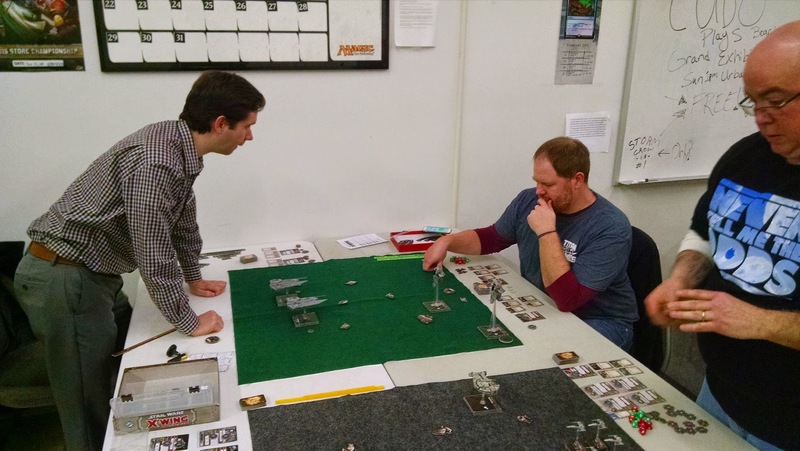 According to their big wall calendar, it looks like AG has X-Wing on every other Thursday night, though there are some other game stores around where folks play X-Wing too if that time slot doesn't work out for you. I really can't say enough good things about the guys at the tournament. There were no arguments, nobody was stalling for time or any of that nonsense though it was most definitely a competition. Good bunch of dudes and if you're in that Champaign Urbana area and want to play some great opponents, not only skill-wise, but also in attitude and demeanor, I highly recommend you search these dudes out. Solid folks, yo! Last thing, Nick mentioned that Titan Games in Champaign is running a Store Championship on the last possible day which apparently is 31 March. I'm not sure if I'm going to make it up for that one or not- depends on some work stuff. In any case, if you're around the area and things haven't panned out for you the way you wished they would in the Store Championships this year, or you want to get some Scum games in before flying them in an Organized Play tourney, Titan's doing the late tournament deal. I purposely didn't talk much about how I flew and why I lost and all- there's a reason for that. And by that I mean I'm going to talk about it tomorrow. As the old cliche goes, you learn more from your losses than your wins, and using my A-Wing list these past couple of weekends, I've learned a lot! Lols. Tomorrow I'll do another of those "Why Did I Lose?" articles like I've done in the past. Hopefully you'll not only see why my games went the way they did, but maybe it'll also help you dissect your losses so you can build upon them in the future. 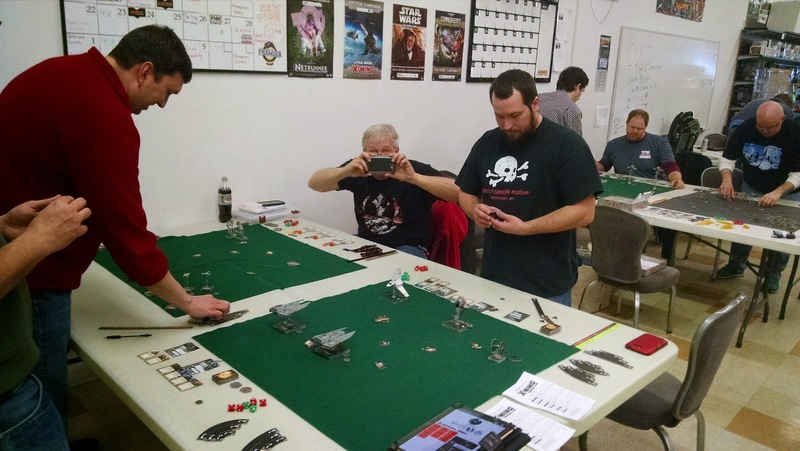 Thanks again to Nick and Armored Gopher for putting on another fun Store Championship. See y'all next year!